I have spent the past few months house hunting in Cornwall. I thought I was looking for a new home, but actually I'm finding a lot of sad stories, any one of which expanded into fiction would make the basis of a good novel. People splitting up so the house has to be sold to split the equity... people who love their small home but have to move on because of a growing family... tenants who have lived there happily for years, but are being evicted because the landlord wants/needs to sell up... death in the family... infirmity forcing older people out of their much-cherished cottage into something more practical... redundancy. And then those strange places where the estate agent seems reluctant to tell you anything at all, and my writer's imagination starts working overtime... What exactly does "ready to go" mean? Are the neighbours horrible/drug dealers/axe-murderers? Truth is, a new home is not the easiest of things to find, even (I imagine) if you are looking for a standard 3 bed on a housing estate somewhere close to a station and a good school and have half a million pounds to spend. But for an author, with a more modest budget and a rather stranger wishlist, it can be a minefield. Estate Agents seem to speak an entirely foreign language. Estate Agent (eager to welcome a potential new buyer): How many bedrooms? Author: Two or three if I can afford it... or one would be fine... as long as it also has room for all my books and a private, quiet space to write. EA: Just for yourself, then? Author: Plus my muse. And the cat, so it can't be on a busy road. EA: (tosses a couple of properties on the side of the busy A38 back into the drawer.) Location? Author: Peaceful (didn't I just say this?) so I can disappear into my fantasy world. Also, I need to be close to a station so I can commute for my Royal Literary Fund Fellow posting, and to London to see my agent/publisher. EA: Er, you do know Cornwall is rather a long way from London...? Author: I only need to commute in that direction when I actually have an agent/ publisher. EA: Ah, so you're looking for a holiday cottage/second home? (Pulls out a few overpriced 'luxury lodges' that come with thousands of pounds per annum site fees and a holiday restriction). Author: No, it'll be my only home. Author: £200,000 max. (Feels the need to add apologetically: "I'm not exactly JK Rowling."). EA (trying not to sound too disappointed at this apparently miniscule house-buying budget): So are you looking for a house, a flat, or a bungalow? Author: Anything, as long as it has the right "feel" so I can write there. And I'll need somewhere to park my car while I am working at home. EA (throws the tiny cottages with dodgy parking that have been weekend homes back into the drawer): Does the parking have to be off-road? Author: Yes (duh!). I also have two bicycles, so a garage or shed would be ideal. Author: Did I mention the cat? And I sometimes ride horses and enjoy walking in the woods, so somewhere to store muddy boots, etc. EA: What about these? (Having guessed my age as possible "early retired", pushes across a pile of ugly 1950s - 1970s bungalows). Author: (totally uninspired, but at least they have gardens and some have garages) I'll take a look at the outsides and let you know. EA: What do you like, then, exactly? Author: I'd like to view this one! (quirky property just returned to market, looks interesting if a bit expensive). EA: Ahhh... sorry, we can't do a viewing there that day, we're very busy (presumably trying to sell the practical but uninspiring bungalows, dodgy houses on the edge of the main road, and tiny overpriced holiday cottages without any parking). So what would you look for in the ideal fantasy author's home? * Countryside views, so village or edge of a town - but not where there are plans to build 1,000 new houses in the neighbouring field! * Good local community and nice neighbours, where I'll feel safe living alone. * Garage, ideally. Plus off road parking. * Easy drive/walk to a mainline station for when I have a publisher, paid work, or a major UK book tour. * Peace and quiet for working on my books at home. * Private garden for when I am not to outside appearances working, but actually dreaming of plots/characters with the possibility of rushing back inside to the computer as soon as inspiration strikes or my current plot tangle sorts itself out. * Gothic windows would be nice with an inspiring view to gaze at whilst waiting for inspiration to strike... or maybe no view at all so I'll get more writing done? * Close to other writers and artists for coffee and sympathetic chats when inspiration goes AWOL. * Good cycling and walking in the area, with horses/riding/livery stable nearby. * Stone walls for that essential castle-like feel. Better still, a small castle with a moat for keeping out other people's kids and confused EAs. * Open fireplace for burning the furniture in hard times, and possibly roasting roadkill on a spit if things get really desperate. * Maybe a listed building in an Area of Outstanding Natural Beauty, so the neighbours can't indulge in endless 'home improvements' that result in an ugly conservatory/extension across your inspiring view and overlooking your once-private garden (disturbing your muse with their building noise and mess while they do so). 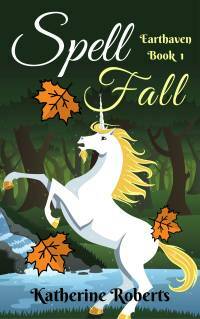 Katherine Roberts writes fantasy and historical fiction for young readers with a focus on legend and myth. She also writes historical fiction with a touch of romance for older readers under the name 'Katherine A Roberts'. House hunting is a very depressing activity! Hope you find something that works for you! And don't give up on ugly outsides - I had friends who bought a 50s style ex-council house but then put in stripped wood floors and rugs and a wood-burner and their amazing jumble of old furniture and it transformed it! Katherine - I too have considered moving to Cornwall, as my daughter and her family live there, BUT - I don't drive, and public transport is awful (I'm accustomed to North London where it's great). But it's a beautiful place if you look away from the horrors local government architects have inflicted on it (hard, sometimes). Oh, and the bungalows... Would suggest you live wild, with a tame dragon to look after the heating/intruders etc etc and the uncorn for transport. Perhaps Wales is a better option or parts of North Devon, though these can be rather remote! Good luck with the hunt - if you fancy a doer-upper then old chapels often get put on the market and typically are around 40k to convert nicely. 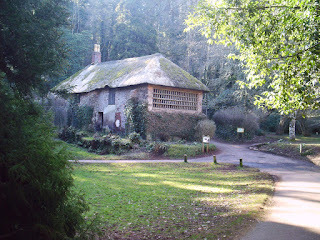 PS That pretty little thatched cottage in the wood? It's not mine, and it's not for sale. But if you fancy volunteering for work in Cockington Country Park, you can actually live there... they've done it up a bit since this photo was taken!